Attracting beneficial wildlife to your garden is not only good for you, it is also good for the environment. Butterflies and bees ​cannot tolerate any rate of toxins, so they are great indicators that you are gardening organically, and that is good for you as well. To attract butterflies, your focus is brightly colored blooms and creating an environment where they can drink nectar and rest safely. Sometimes, growing a garden with beneficial insects in mind means they will be laying eggs where you may find them. To prevent accidentally injuring something that you might otherwise want to keep, it is a good idea to buy a simple insect identification book, or do a little research, to see what beneficial insects will be found in your region. Lavender is showy and fragrant, making it perfect for both beneficial insects and gardeners alike! Since there are so many varieties and colors of lavender, they are perfect choices for any style garden. Lavender is best known for its oil. Medicinally, it is a gentle healer and the soothing, relaxing properties are widely known. No need for essential oils, however. You can grow lavender in the garden for the insects, then harvest the flower buds just before they open and enjoy them yourself, the rest of the year. One thing about lavender, it blooms early and continues until hard frost. 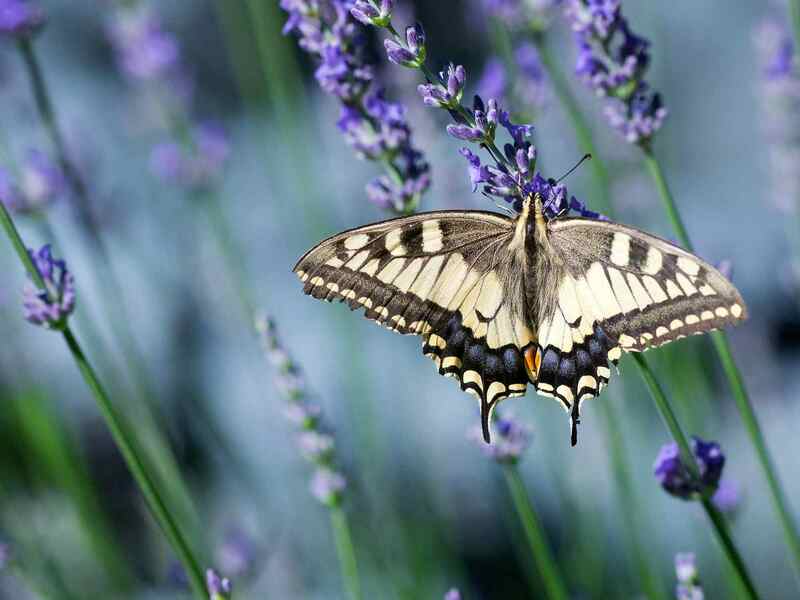 Very reliable and especially good for attracting insects, lavender is a must-have in the butterfly garden. Classified as catnip or catmint, this is an herb that needs to be in your butterfly garden. Herbaceous and perennial, catnip will take over the garden if not kept contained, so plant this lovely herb in a pot and then plant that pot right into the ground to slow the roots down. Not just for cats, catnip is a fierce attractant for butterflies. Be warned that the effects of catnip on cats are entirely true! For most cats catnip is an intoxicating scent and they will not only come into your garden, they will be all over the plant, rolling and chewing it to death. If this doesn't sound attractive, you may have to fence off the plant or keep a close watch on it. Catnip comes in different varieties, both tall, short, and sprawling which makes it a great choice for all types of landscaping. Perfect for any herb garden, chives suit the butterfly garden especially well. Since they are a clumping herb, they will stay put for the most part only becoming rounder and larger over the years, never popping up in unexpected places. Bees and butterflies are especially attracted to chives. The fat, fluffy blossoms are irresistible to insects. Fennel is the perfect addition to your beneficial butterfly garden. It is showy, growing up to five or more feet tall, and at least that large around. Insects are drawn to it like no other herb. I have to be extremely careful to look over my fennel fronds carefully since usually there will be caterpillars hanging on for dear life as I bring in my basket of herbs. Yarrow is a wonderful choice for your beneficial insect butterfly garden. It's spicy scent and showy flowers can withstand pretty harsh treatment, and continue to bloom long after the other flowers succumb to drought or lack of sunlight. Your local nursery will have multiple varieties of yarrow, with a wide range of colors and flower shapes. Check it out!